The National Institute of General Medical Sciences of the National Institutes of Health has awarded scientists of the Jupiter-based Scripps Research Institute a grant of about $1.8 million. The grant will be used to develope a series of drug candidates to treat a number of ailments, including heart disease, rheumatoid arthritis and several neurodegenerative disorders. Jupiter Orphan Therapeutics has secured $2 million in financing from an Australian investor as it continues to work on developing treatments for rare diseases. The Palm Beach/Treasure Coast Chapter of BioFlorida is having their 2017 kickoff event Monday, January 30th from 5:30pm – 7:30pm. 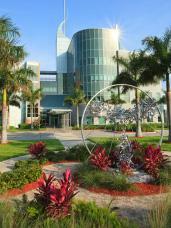 Hear from the president and chief executive officer for Jupiter Medical Center, key spokesperson for the FAU Jupiter Life Sciences Initiative and lead counsel for Sancilio & Company, a fully integrated specialty pharmaceutical company. Also, experience robotic surgery first-hand through a demo of the da Vinci Robotic Surgery System. Specialty-specific health information technology company Modernizing Medicine, Inc. today announced that EMA™, modmed Ophthalmology’s™ EHR system developed by practicing ophthalmologists, now includes several product enhancements, as well as an interface with FlexSys to enable an optical inventory solution.